Who do you count on when the weather gets rough? Do you have the right crew assembled for when the next storm system comes through? At a recent Lumunos retreat, we looked at the story of Jesus calming the storm A part of our conversation was about who constitutes our crew when we face the storms of life. Story after story was told about the importance of having people with us when we face those times of trial. • the “I need to tell you as a friend that you have a storm brewing in your life and you don’t even see it coming” friend. We also talked about the unexpected crew member, the person who is outside our preconceived notion of who are friends are. But by the grace of God, they show up and help us get through the storm. Soon we will be in Holy week, which represented a kind of perfect storm for Jesus. It is almost as if he experienced all the kinds of trials we face, concentrated in a few days. I wonder if he had cultivated his crew in part as preparation for this storm. Some of these crew members let him down in big ways. But he too experienced the grace of a stranger stepping out of the crowd to help carry his cross. 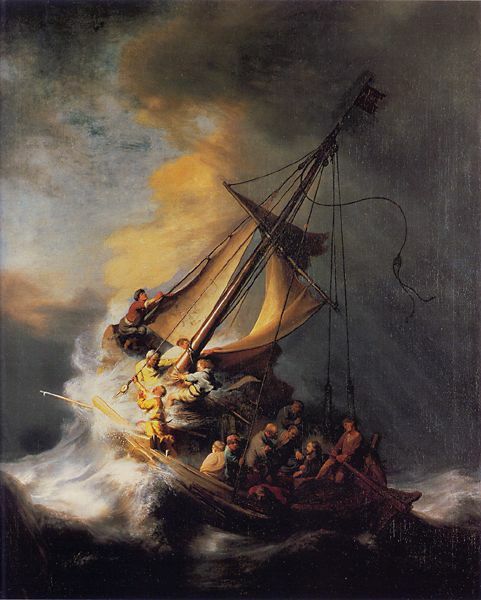 Question: As we head into Holy Week: What kind of crew member do you need for a current or upcoming storm? What kind of crew member are you called to be for another? A wonderfully thoughtful blog, Doug! It helped me value the different gifts my friends bring to me; some of which are easy to ignore, overlook or undervalue. It also reminded me of one of your gifts: of looking around the corner to see life from totally new and refreshing angles and, in doing so, to discover the variety of ways in which the Spirit comes to meet me on my most challenging journeys. Thanks for being a continuing gift to me! As always, you make me think on a deeper level than my typically slapdash southern way, Doug! Thanks for being that discerning crew member for me on the bigger issues I sometimes miss. At a particularly difficult time in my life I found that my usual support system was not making me comfortable. By God's grace, an older Faith at Worker quietly entered my home and heart to help me to be still enough to begin the healing process. She fed me her homemade soup, covered me quietly as I napped, and always brought the silence of the Lord into the room with her soft voice. Never in a million years would I have considered that woman what I needed, but God KNEW! Thanks for reminding me about these angels who are part of my expanding crew. Thanks for your story. That is another kind of friend--the "feed me soup and cover me quietly while I napped" friend.